Before taking a turn with Blade Gruts, you may first take a turn with any Orc Champion you control. Blade Gruts are never attacked when leaving an engagement. As Orc Warriors, Blade Gruts may benefit from Grimnak and Tornak’s ORC WARRIOR ENHANCEMENT attack and defense bonus. As Orcs, Blade Gruts may benefit from Nerak the Glacian Swog Rider’s ORC DEFENSIVE AURA 1. As Orc Warriors, Blade Gruts may benefit from Ornak’s ORC BATTLE CRY AURA attack ability. Blade Gruts -- What's Your Army Idea? Last edited by superfrog; March 21st, 2019 at 02:09 PM. After playing with the Heavy Gruts so much I just realized that these guys are only forty points. That really makes me want to get a few packs. These guys are awsome swarmers. Though I should try the Heavies more often, the Blade Greats' cost & one extra space of movement keeps me returning to them time and again. I got nothing but love for these sneaky bas**rds. I specially like the one swinging two swords. It is simply the coolest orc common squad unit out there IMO. 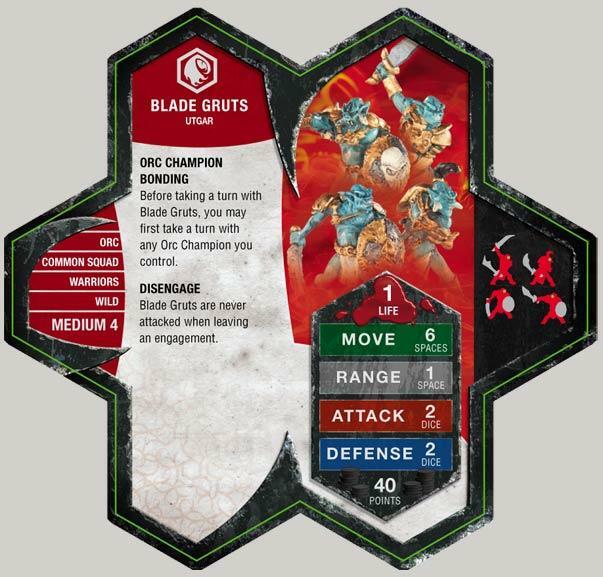 I guess that the heavies of wave 6 were made in part to give the orcs some stronger units as the wave 1 blade orcs seemed underpowered against the Romans and Knights. The heavies level the field definitely against those and might have an edge over the Romans themselves. I'll personally ake the Heavy Gruts or Arrow Gruts over the Blade Gruts. Blade Gruts hit hard and fast. I love to rush these guys in with Tornak at the beginning of a game and create some chaos. Try them with Tornak, Ornak, Grimnak, and Torin for some fun. Minutemen don't want to shoot them because of the ranged counterstrike. Pair that with the bonding and the mobility that Ornak provides the heroes...you have a nasty combo. leaves how many points actually available for Blade Gruts? During my playtesting for the Raids of Vahalla (Skirmish Maps), many, many games on BoV maps and the occasional Massivescape game, I actually find that I like the Blade Gruts more in a smaller type game versus a massive one. Take the core Grimnak + Blades x2 for example. In the low end of skirmish games, that's your army right there. However, it is quite easily expandable to different values. At 250, add in Nerak to give a defensive boost, and at 300 you can put in another squad of blades on top of that if you don't mind losing 10 points. For 350, you can take your core plus Nerak and add in Syvarris to make the enemy come to you, Krav for cleanup/leading force, or Heirloom for a special attack. Tornak is always an option to punch through tough defence, but usually a different force is the better idea because you don't want too many champions to blade gruts. This is a 450-point army core, build off of it from there, depending on how many points. This book is currently missing any C3V/SoV synergies for new cards like Hrognak.